What I Loved: Spencer! I wasn’t sure what I would think about him when the story started. He, above anyone else, pointed out his flaws, why he wouldn’t be good for Arizona, and several other reasons why a girl should find him a good man but a damaged one. Yet, it was because of all of that and his treatment of Arizona that he became the most compelling character in this story. Arizona had a distinct way of making him prove through actions what kind of man he truly was! It was his treatment of Arizona and his neighbor that really sold his “good man” status to me. Needless to say I loved the man! What I Liked: Arizona! I was already intrigued by her at the end of Jackson’s story. She had a horrific past and the more we found out about it in this book, the more I wonder how the poor gal was functioning at all. Instead, while she did have her flaws, she was fighting to live and fighting to prevent people from being used the way she was. I admired Arizona in so many ways. She had a shaky road but managed to work her way through it. While I didn’t find her as intriguing as Spencer, I did find her compelling. What was a little lacking: Not enough of the other wives even though we saw the Boys. Since this was the last in the series I wanted a little more time with them. Final Thought: I really loved the Men Who Walk the Edge of Honor series. 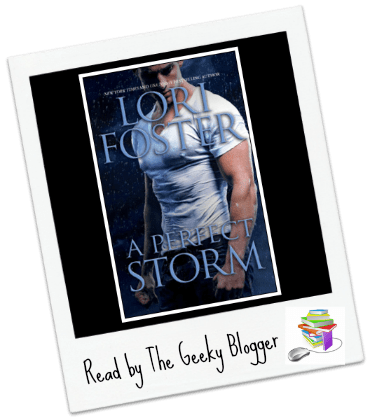 It was my first time reading Lori Foster but it won’t be my last! I definitely read something by Lori Foster I am sure of it. The leading men in her books are just UNF. I think I'm gonna be perfectly happy with just getting my fill of the boys! LOL Can't wait to read Spencer's story! I loved Spencer too! I think Arizona was my fave heroine of the series tho. The men in this series do outshine the women. 😀 Glad you enjoyed it too! I loved Spencer! I think my favorite heroine was "she of the horrid name" (Book 1–I refuse to type the name LOL) but Arizona was a close 2nd! Arizona was good in this book but Spencer was just a doll! Whenever I see the words Bounty Hunter, I always think of Dog the Bounty Hunter, unfortunately setting a stereotype. This novel sounds so much better than a couple of drug busts, and your description of Spencer is fantastic. Great review! LOL I could see where that would be a distraction from wanting to read a Bounty Hunter book. I would have to giggle.